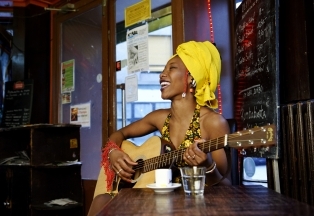 Perpetuating Mali’s rich musical tradition, Fatoumata Diawara presents a joyous mix of the vibrant and understated, combining songs about love, politics and empowerment. With arresting melodies soaring over intricate guitar and drum arrangements inspired by Wassoulou tradition, jazz, and blues, Fatoumata has created her own unique contemporary folk sound with a distinct African spin to the concept of the female singer-songwriter. This engagement of Fatoumata Diawara is funded through the Mid Atlantic Tours program of Mid Atlantic Arts Foundation with support from the National Endowment for the Arts.